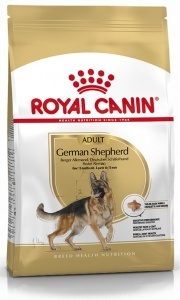 Royal Canin dog food ensures maximum digestive well-being for the German Shepherd's sensitive digestive system. 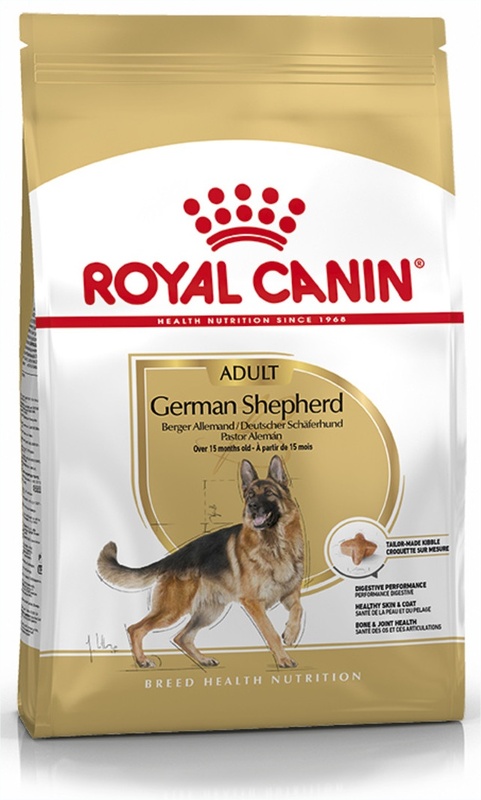 Royal Canin German Shepherd supports the skin's barrier role and helps maintain the natural beauty of the breed's coat. Supports the natural defences of this active dog and helps maintain vitality in older German Shepherds. Helps provide support and maintenance for the joints which are placed under great demand by these very active dogs. rice; dehydrated poultry protein; animal fats; vegetable protein isolate*; maize flour; vegetable fibres; hydrolysed animal proteins; minerals; beet pulp; soya oil; fish oil; copra oil; hydrolysed yeast (source of manno-oligosaccharides); hydrolysed crustaceans (source of glucosamine); green tea and grape extracts (source of polyphenols); marigold extract (source of lutein); hydrolysed cartilage (source of chondroitin).